Global Missiles and Missile Defense Systems (MMDS) market, valued at US$55 billion in 2018, is projected grow at a CAGR of 6%, to value US$93 billion by 2027. The cumulative market for global expenditure on Missiles and Missile Defense Systems is valued at US$ 725.37 billion over the forecast period. Demand for missiles and missile defense systems is anticipated to be driven by the massive investment made by countries like US, China, Russia, Israel in the development of next generation missiles & missile defense systems and the large scale procurement of such systems by countries like Saudi Arabia, India, Japan and South Korea. The United States is the largest spender in the domain with China, India, Russia, Saudi Arabia, Japan and South Korea anticipated accounting for the bulk of spending. In terms of categories, missile defense systems (MDS) is expected to account for the highest proportion of spending, followed by markets for cruise missiles, ballistic missiles, air to air missile, directed energy weapons and anti satellite weapons. The market for missile defense systems is anticipated to be the largest category primarily due to the ongoing procurement of missile and air defense systems by countries of the Asia Pacific, North America and European regions. North America is expected to account for the largest share of the total global expenditure on missiles and missile defense systems followed by the Asia Pacific Region where countries like China, India, South Korea and Japan are investing billions to procure missiles and missile defense systems. The report "Global Missiles and Missile Defense Systems Market Forecast to 2027" offers detailed analysis of the global Missiles and Missile Defense Systems market over the next ten years, and provides market size forecasts. Furthermore, it covers key technological and market trends in the industry and analyzes factors influencing demand for Missiles and Missile Defense Systems. 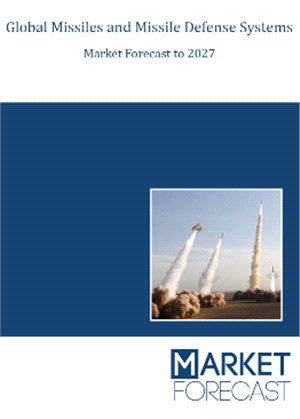 Market Dynamics: Insights into the technological developments in the Missiles and Missile Defense Systems market and a detailed analysis of the changing preferences of governments around the world. It also analyzes changing industry structure trends and the challenges faced by the industry participants. Segment Analysis: Insights into the Missiles and Missile Defense Systems market from a segmental perspective and a detailed analysis of factors influencing the market for each segment. Regional Analysis: Insights into the Missiles and Missile Defense Systems market from a regional perspective and a detailed analysis of factors influencing the market for each region. Trend Analysis - Key Defense Market: Analysis of the key markets in each region, providing an analysis of the Missiles and Missile Defense Systems segments expected to be in demand in each region. Competitive landscape analysis: Analysis of competitive landscape of the global Missiles and Missile Defense Systems industry. It provides an overview of key defense companies, together with insights such as key alliances, strategic initiatives and a brief financial analysis. Companies mentioned in report: MBDA, Raytheon, China Aerospace Science and Industry Corporation, Almaz Antey, Rafael Advanced Defense Systems, Lockheed Martin, Boeing, Kongsberg Defense Systems, Saab , Northrop Grumman, Rheinmetall Defense, Thales. Missile and Missile Defense Systems Market is projected to register a CAGR of 6% over 2018-2027. Cruise Missiles & Ballistic Missiles are anticipated to account for the third and fourth largest segments in terms of expenditure over the forecast period. The remaining market share is held by air-to-air missiles, anti satellite weapons and directed energy weapons.